General James Jones delivered a speech at the Iran Uprising Summit, held on September 22nd at the Sheraton Hotel in New York, calling for a tougher stance towards the clerical regime. The event, which took place at the end of September, was organized by the Iranian opposition and featured speakers from around the world. Jones was President Barack Obama’s National Security Adviser between 2009 and 2010 and helped form foreign policy under the Obama administration. Jones began his speech with a damning assessment of the Iranian regime. He told the crowd that he believes the Iranian regime remains the globes biggest “existential threat to peace and stability”. He described the regime’s behavior as “unrelenting” in its quest to “undermine our values, our freedom, and our prosperity”. He criticized the regime’s human rights abuses and the manner in which it flaunts international law. Jones specifically referred to the regime’s attempts to undermine the Middle East peace process and its financing of terror and militia groups in Syria, Yemen, and Iraq. The regime actively promotes Sharia-Sunni conflict in the Middle East, with the goal of “establishing a land bridge from Tehran to Beirut via Iraq and Syria”. Jones asserted that the United States, along with its allies, “must do everything necessary to prevent these territorial ambitions from being realized”. He went on to warn of “grave” implications if the regime succeeds in its ambitions. “The result will be more death and suffering, more destruction [of] the kind that the regime and its proxies have been inflicting across the region”, he said. Jones also referred to the heavy losses inflicted on the Iranian opposition, including the People’s Mujahedin Organisation of Iran (MEK). He mentioned the attacks on Camp Liberty and Camp Ashraf which left 140 dead, 7 abducted, and more than 1300 wounded refugees. “We must no longer accept passivity and weakness in the face of this tyrannical regime,” he said, adding that one of his greatest regrets was that the United States did not act faster or more decisively in the wake of the regime attacks on Camp Ashraf and Camp Liberty. Jones was adamant that the challenges he describes are not things of the past. 1,900 MEK members are living in exile in Albania, but the Iranian regime still pursues them. The General also drew attention to the foiled terror plot in June, where the regime orchestrated an explosive attack against the MEK in Paris. It was foiled by Belgian authorities in the late stages. 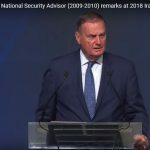 General Jones also alluded to the fact that there was general bipartisan support for a tougher stance against the Iranian regime. He cited the current National Security Adviser under President Trump, John Bolton, who, Jones said, “has remained steadfast in his support” for the Iranian opposition. Bolton later thanked the General over Twitter for his “kind words and leadership on Iran”. Bolton, a staunch Republican, and Jones, a Democrat, personify the bipartisan agreement on the Iran issue in the US. As evidence for a tougher Iran policy in the US, Jones went on the describe the domestic situation within Iran. He echoed Secretary of State Mike Pompeo’s comments, who described the protests as “the most enduring and forceful protests since 1979”. Jones told the audience that the regime has imprisoned thousands of its own citizens, but he celebrated the “courage and passions” of the people who continued to demand their right to liberty. He described the economic climate of rising inflation and a collapsing rial. “Some will point to the sanctions, old and new, as the culprit. But ladies and gentlemen the true culprit is the regime that rejects the international norms of behavior on which orderly relations, global trade, and economic engagement are based,” he said. Jones defended Trump’s decision to withdraw from the Iran nuclear deal. “Could Tehran really have been surprised given the lack of trust produced by its relentless reception, history of non-compliance and deadly support of terrorism?”, Jones asked. In another gesture of bipartisan cooperation on Iran, Jones also praised Mike Pompeo’s economic sanctions. Finally, Jones drew attention to the MEK and Maryam Rajavi’s Ten Point Plan, describing them as “Jeffersonian principles that every freedom-loving member of the human race can embrace and every form of tyranny fears”. He acknowledged the role of the United States and its allies in bringing Maryam Rajavi’s ten principles to fruition. He suggested that the US monitor the regime’s nuclear development program and prevent it from realizing its nuclear goals. He also urged the United States to make progress on bringing peace to Syria to prevent Iran from using it as a proxy.